Since February of 2007 I have had this interest in finding out why the push for the HPV vaccines when there is no epidemic of cervical cancer in the United States. All that I have learned during this time is astounding. 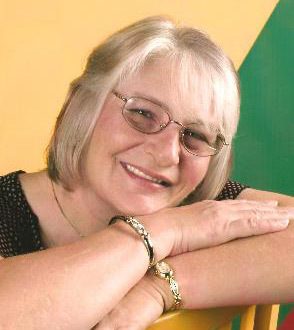 I have come to learn that the diseases of old age could be due to the depletion of glutathione that occurs around the age of 40 and that some people/children could be deficient or have a gene that is damaged which would also cause this issue. A family history of allergies or auto-immune disease is a common denominator in who is affected. Vaccines are designed to create T-helper 2 responses which immunity is short lived and an inflammatory response. Gardasil injured have similar symptoms to the children affected by autism that cannot speak. I also learned about Oxidative stress, pH balance, IgE, histidine which is an amino acid involved in the repair of tissues and a plethora of other scientific information. So many things of interest I have learned because I decided to educate myself to the workings of the body. At this time, I want to thank a special someone for asking me to review the VAERS (Vaccine Adverse Event Reporting System) and I am compelled to show you what I found. Once again I did an analysis of the VAERS. I was shocked and appalled by what I found. Here are the stats and you decide whether the vaccines single benefit which has not been proven outweigh the risks. The one thing I want to remind you is that this is only 1–10% reporting to this data base. What I did was compare the reports of the HPV vaccines and all other vaccines received after June of 2006. I selected this date because that is when the HPV vaccines were approved by the FDA to do my comparison. This is what I found. Interesting isn't it. 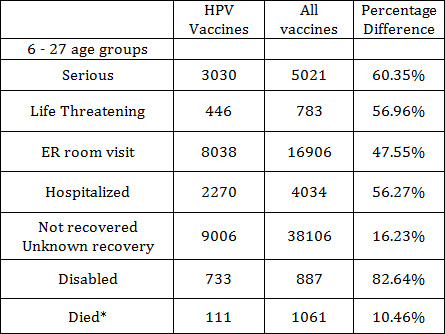 When you compare the two you see that there is a distinct increase in adverse events reported listing the HPV vaccines in the age group 12-17 year olds. This is due to the push to receive the vaccine at this age by doctors. I know from speaking with 100's of families that the majority affected had no reactions perceived to any other vaccines prior to administration of this one. What this tells me is that the HPV vaccines have the potential to do more harm than good compared with ALL other vaccines given. Recently I met a young girl who along with her sister received all three doses of the vaccine. They both had reactions in the doctor's office (tingling of the extremities, nausea, blurred vision and fainting). These are signs of a mild anaphylactic reaction but the doctor in his infinite wisdom had them receive all three doses with reactions increasing each time. I also found out that she fell after the first injection and had to go to the hospital with a concussion. During our conversations I found out that there is a family history of allergies which coincides with my findings. Her sister has now been diagnosed with PCOS (Polycystic Ovarian Syndrome) and has other mild symptoms. This is a common finding in those affected. The doctor is not connecting it to the HPV vaccine so there are no reports. Her sister is under the care of a gynecologist now. This is sad. This is just one example of what could be thousands of cases and the families. They have no clue that the vaccine is the culprit in the medical problems their daughters and sons are having today. This is depleting the insurance coverage of these families and possibly any savings that they have to pay for all the doctors' costs. As you can see in the totals that in the same time span (June 2006 to present) there is a difference of just under 6 thousand reports. What is noticeable is the spike in reports in the 12–17 age groups for the HPV vaccines by 7780 reports. This is the heavily vaccinated group due to school requirements. Let us examine this a little more. I removed all reports from the "All vaccine" category that referenced the HPV. This shows that the age groups from 9–12 have a jump in reports compared with the 6–9 age groups. In the 9–17 age groups which is heavily vaccinated due to school requirements there is a steady reporting rate. 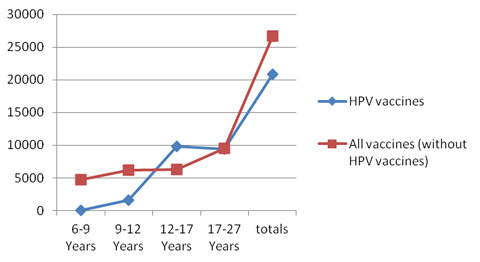 In the 17–27 age groups you see a dramatic incline in adverse events reported which is similar in number to the HPV group. I wonder if the increase in this age group could be because of the vaccine requirements for college. Now look at the HPV vaccine groups. In the 12–17 age groups you see an increase similar to the one in the 17–27 age groups for "All Vaccines." What is noticeable is that the 12–27 age groups the reporting is steady and I consider high. What all this proves to me is that we can expect that an average of 3,600 new reports every year due to the addition of the HPV vaccines. Does the single benefit that is unproven outweigh the risks? When I saw this I had to ask myself where the benefit is. We do not even know if the vaccine truly works long term. Will individuals be required to get a booster later in life? We just do not know. From all my experiences with communicating with families of individuals affected by these vaccines in some way or other, I believe, that the 1% rule applies here. If that be true then these are the real numbers. Using the same calculations above we have the potential to have 368,200 new cases of adverse events per year and that a majority will not be reported. One example is the conversation that I had with that young girl. How can the benefit outweigh the risks if this was your son or daughter who has a new medical condition? Let us look at what the CDC has to say about cervical cancer. "Cervical cancer used to be the leading cause of cancer death for women in the United States. However, in the past 40 years, the number of cases of cervical cancer and the number of deaths from cervical cancer have decreased significantly. This decline largely is the result of many women getting regular Pap tests, which can find cervical precancer before it turns into cancer.1"
*Incidence counts cover approximately 99% of the U.S. population. Death counts cover 100% of the U.S. population. Use caution in comparing incidence and death counts. What I found interesting in the CDC statement is that HPV as being the cause of cervical cancer is not mentioned. Could that be because it has not been truly proven that HPV causes cancer but in reality is only present in the cancer cells? Maybe. With these numbers from the CDC they feel it is okay to potentially injure 368,200 young people each year to save 4,021 from the disease. How does the single benefit outweigh the risks? I don't see it. HPV (Human papillomavirus) is a virus and a virus cannot live in an alkaline environment. This is proven every time you put chemicals in your pool to boost the alkalinity of the water to kill the bugs. Simple science to me. If you maintain the body's immune system to its optimum levels and have a body serum pH of 7.35–7.45 the body should rid itself of the virus according to scientific literature. It is a well known fact that even babies can have the HPV virus and that the body usually rids itself of the virus in 6 months to a year and a half. It has been said that a child getting HPV was a rite of passage of childhood. When I was young getting measles and chicken pox was just one of those childhood diseases that you got. We did not have all the vaccines like the children are exposed to today. You know what; we all got the measles and chicken pox in my neighborhood which was filled with kids. None of us died. One youngster who was frail did get rheumatic fever after the measles which mildly impacted his heart. That was one out of dozens and dozens of kids. No one in my neighborhood or school was mentally deficient like the Autism children which are now 1 in 88. We ate fruits and vegetables from the vendor that came down our street with his truck once a week during the spring, summer and fall. This is pre-pesticides and GMO (genetically modified organisms) like we have today. We ate organic foods. Nothing with jacked up hormones, steroids, etc. Hey, there was even cream on the top of the milk we had delivered and my dad got to have that in his coffee. This was in the 50's. Let us continue. In matters such as this it is always easier to get the full impact of numbers with visual aids. That is what I did with the pie chart below. I took the numbers from the tables and figured out what the percentage difference was between the two categories. 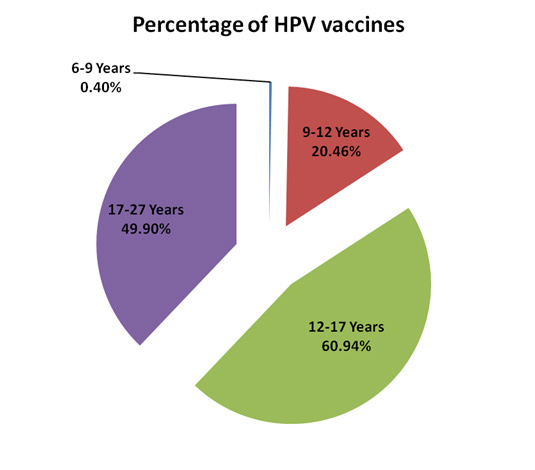 This chart reflects the HPV group. What I found was that in the time period from June of 2006 to present the HPV vaccines contribute to an over 50% increase in reports in the 12-27 age groups. The largest percentage is in the 12–17 age groups with 60.94% difference between the two HPV vaccines and all the other vaccines combined. If I had a business that reported a 60.94% increased injury ratio I would close the doors or fire a lot of people for not doing their job to protect my employees. That would be the prudent thing to do. Would you accept this injury ratio where you work? Here are the most recent stats taken from the VAERS database provided by MedAlerts.org. *This age group is from < 3 Years to 44-65 Years. Once again I want to remind you that this is only 1–10% reporting to this data base. What we have here is that one type of vaccine reflects 82% increase in reports which indicate the individual became disabled compared with all the other vaccines combined. An additional 57% increase were life threatening, 56% had to be hospitalized and an additional 60% were serious. Consider this, without these two vaccines would we have an increase of over 78% reporting of new medical conditions and adverse events to VAERS? Personally, I do not think so. This does coincide with the percentage of "New Medical Conditions" reported by Merck to the FDA of 73.3%. So this increase was expected by the FDA and Merck. When put in this manner I cannot see how the heck the single benefit of preventing cervical cancer (which has not been proven yet) where the HPV is present can outweigh the risks. To me all the RISKS outweigh the single benefit.